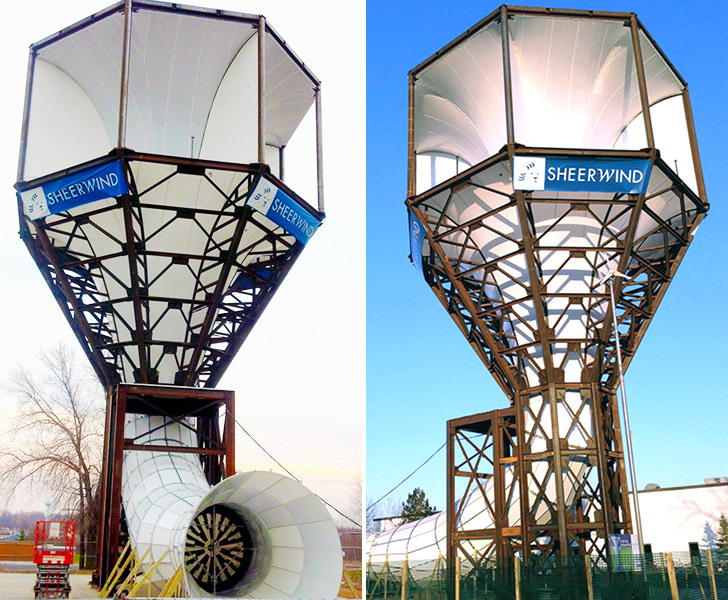 US-based wind energy company SheerWind just unveiled the INVELOX – a tunnel-based wind turbine that can produce up to 600% more power than traditional wind turbines. The company states that after extensive field-testing, their new INVELOX turbine “significantly outperforms the traditional turbine” and could reduce installation capital costs to less than $750 per KW. The INVELOX energy system works by capturing ground-level breezes and funneling them through a tapering passageway that naturally accelerates wind flow. Unlike other turbines, it also minimizes environmental and animal impact, and it requires no government subsidies to be profitable. All of this makes INVELOX a potentially game-changing renewable energy solution that could be easily integrated within commercial renewable energy operations. “Our ability to operate efficiently and effectively in areas never considered viable with traditional wind energy and at costs as low as $10 MWH makes SheerWind a true game-changer in electric power generation.” Watch the below video to see how the INVELOX turbine works. Check out latest projects on SheerWind.com. No Hype, All Substance! I was always curious, why nobody makes chimney turbines? This one looks like it! Finally, but it\'s upside down. Great development. Although I would not think that rain would be much of an issue, snow and ice might be another whole thing, perhaps requiring energy for thermal removal (a black collector and tunnel would likely be in order, to start, for colder climes). Other than that, looks like the Venturi effect finally gets its comeuppance for wind power generation. The obvious advantage of installing/maintaining a turbine/generator at ground level, rather than on-tower, is a real winner, as well. Put those on top of every building, and electrician tower, then also put them as the 'air intake' for every industry that uses any air movement by current electric fans, as another use, while also generating some electricity during higher winds. It could also be used to supplement the air intake for over pressure fume filtration systems. LOL! THAT's a really cool science experiment...Dad woulda LOVED that [he used to guest on the Mr. Wizard Show many years ago]. ...HOW can this be used to provide household energy? Any use for it besides fun learning op? Can the static electric it does produce, operate a little pump to keep the water recycling to the upper container? Charge batteries to run electronic things? Really like that tornado type wind gen. Couple that with the new "giant crystal ball solar generator" someone posted not long ago, and this would make a great sculpture garden as well as run the home and farm! I would like to see video of one in operation and open to public observation. The traditional tri-blade wind turbines have never been efficient and are hugely detrimental to our bird and bat population - thousands of each are killed each year. This technology works like a wind scoop aboard a sailboat, which is a low-tech solution to stale cabin air that has worked well for decades, if not centuries. I would NEVER consider putting a traditional wind turbine on our place, but I would have no such reservations with this technology. It appears to be a viable solution. Parabens pelo projeto, para salvarmos nosso planeta equipamentos como esse vem a contribuir com a melhora... Roberto Battisti - Brasil! 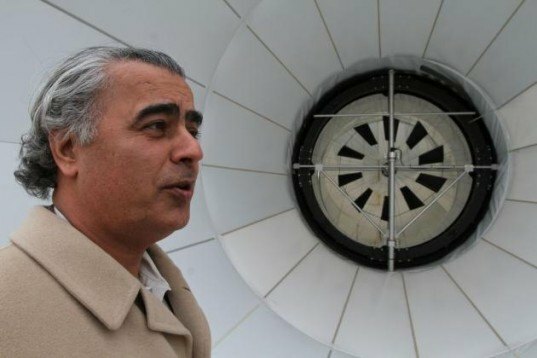 US-based wind energy company SheerWind just unveiled the INVELOX - a tunnel-based wind turbine that can produce up to 600% more power than traditional wind turbines. The company states that after extensive field-testing, their new INVELOX turbine "significantly outperforms the traditional turbine" and could reduce installation capital costs to less than $750 per KW.